was Too Faced's neutral palette. A competitor to the Naked range that was a little less neutral.I swatched and thought over it so many times and I just didn't feel like I needed it. This time around I was swept up. The shade Peanut Butter was what did it. This rich, warm toned palette has lots of mattes and shimmers with one soft glimmer shade, Pink Sugar. So, let's talk about the Semi-Sweet Chocolate Palette. There is something so wonderfully kitschy about the packaging that just fills me with a child-like delight every time I see this palette. There are very few palettes that can make you as happy as the shadows inside. The pigmentation is really good on most shades. I was disappointed with Blueberry Swirl. It will be nice over other shadows but lacks on its own. The rest of the shades were very nice! The shimmers are ultra smooth and none of the mattes drag at all! I am really happy with this. I love the cocoa powder infusion. 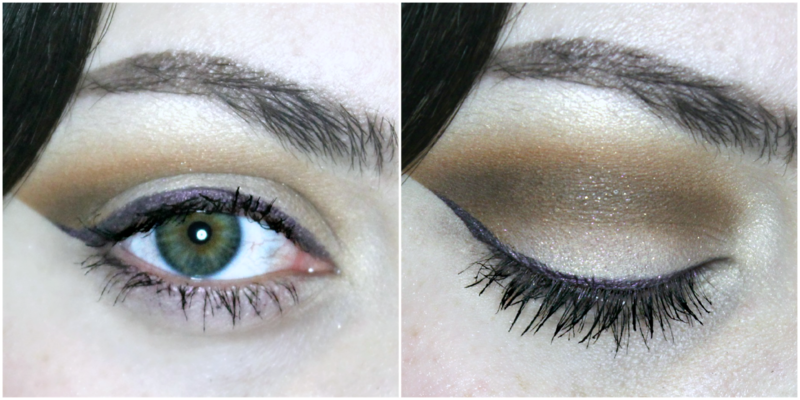 There is nothing nicer than blending your eye shadow and smelling anti-oxidant rich chocolate! I used Butter Pecan in the inner corner and on my brow bone, then worked Peanut Butter in the crease and above the crease, pulling it into the outer V. I softened the edge with Nougat and then intensified the crease with Hot Fudge. (It sounds like I'm making a Sundae.) I then used Coconut Creme on the lid and topped that with Pink Sugar. Over all I think the palette is totally worth the $49. and is a fun and quality addition to any collection. There are lots of looks to be cooked up with the bar of cocoa infused shadows, from smokey, seductive looks to soft ones as sweet as sugar. Which chocolate bar do you prefer the Original or Semi-Sweet? Tell me in the comments!